With little head, this pours out as a light, wine-like pumpkin-orange elixir. So far, so good. It's got the thinner body and mouthfeel of most wild ales. You should probably know that with sour beers, the wild yeast profile almost always dominates — in other words, don't go into this one expecting a heady dose of spices. And there aren't. This is a tart wild ale blended with fruit; but those fruit are fairly unique for the style, and so too is Kick. There are a few main things going on here: 1). sourness / tartness from the wild yeast, obviously; 2) a fruity cranberry flavor (with more subtle pumpkin beneath); 3) a surprising amount of sweetness that somehow survived the souring process, probably as a result of the cranberry, and 4). distantly, if you search for it, hints of nutmeg and allspice and cinnamon, nudging the pumpkin toward your tastebuds alongside that savory sweetness. Weirdly, all these things work very well together. Like gangbusters. Granted, I'm a little biased when it comes to sour beers. I'm struggling to think of a time when I had a beer fermented with Brett that I was terribly disappointed by. If it's got that tart, sour funk, I'm all in. So when I say I really like this one, assume that you won't be let down, but feel free to pass your own meticulous, more specific judgements. If you come to this expecting a pumpkin-heavy ale, you might be disappointed, but I think that's kind of beside the point. I wish I were drinking this alongside Jolly Pumpkin's La Parcela — the other sour pumpkin ale, which I tried last year, but can't remember well enough to compare. Regardless: this beer is delicious. It's sweeter than I expected, and I wouldn't mind it being a bit drier. But on the other hand, that sweetness is probably necessary to let the pumpkin ride along as much as it does; any drier, and only the most pungent fruit flavors would emerge through the funk, I think. On the other hand, the sourness is at about a medium level — if you're on the fence with the style (god help you), you'll probably still enjoy this one. 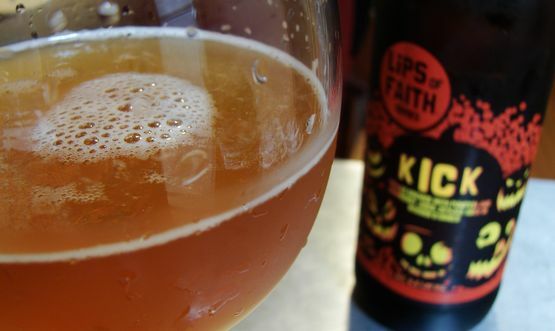 So this is definitely up there with my favorite fall beers; I'd imagine Kick would be an absolutely killer beer to go along with Thanksgiving Dinner. If only I had another bottle or five so I could make that happen.